eLEDGER allows you to import transactions from, say your Internet Banking or Paypal - using the same web browser you use to access those transactions. 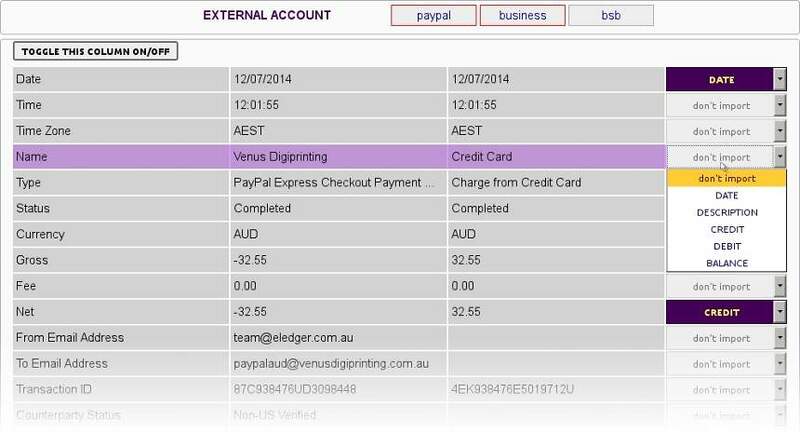 Simply export your records to a CSV file in one tab and import that CSV file into eLEDGER in the next tab. Keep all your records from various bank and payment provider accounts together. You can even import from a mobile receipt image capture app on your phone! Once you've imported them, you can easily assign those transactions as Expenses and Receipts by simply clicking on them - saving you time in creating those records. The system remembers and displays those payment records for you, in future - and of course it makes reconciliation between your accounts that much easier.